Time management does not come naturally to teens, that’s for sure! But there are some simple actions parents can take to support their teenagers in becoming time aware, pro-active, anti-procrastinators. 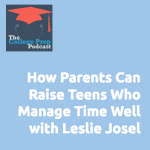 Today’s Guest Expert Leslie Josel shares brilliants tips, tools, and techniques based on her new book for parents called What’s the Deal with Teens and Time Management. 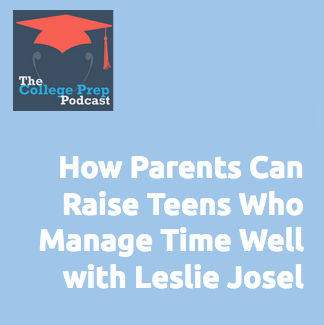 Leslie Josel is the founder of Order Out of Chaos, an organizing consulting firm specializing in student organization and chronic disorganization and creator of the award-winning “Academic Planner: A Tool for Time Management”®. As the author of “What’s the Deal with Teens and Time Management”, she brings over a decade’s worth of professional experience working one-on-one with teens and their families, speaking to teachers, parent and professional groups across the country, as well as the perspective of a mother of a time-challenged teen, to create a parent’s indispensable guide through the time management journey with their teen. Follow her on twitter at @order00chaos or on Facebook at facebook/orderoutofchaos.